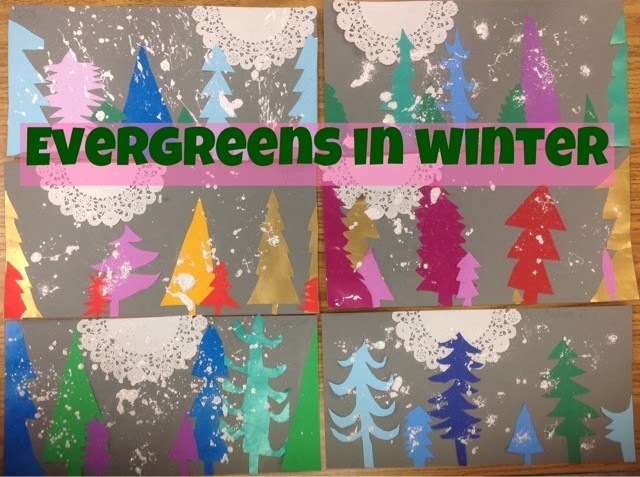 Two 45 minute sessions: one for intro, sketching, choosing colors and cutting; one for gluing, painting, glitter, art walk. 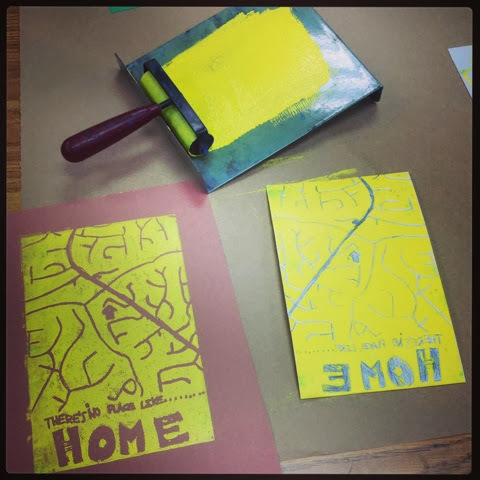 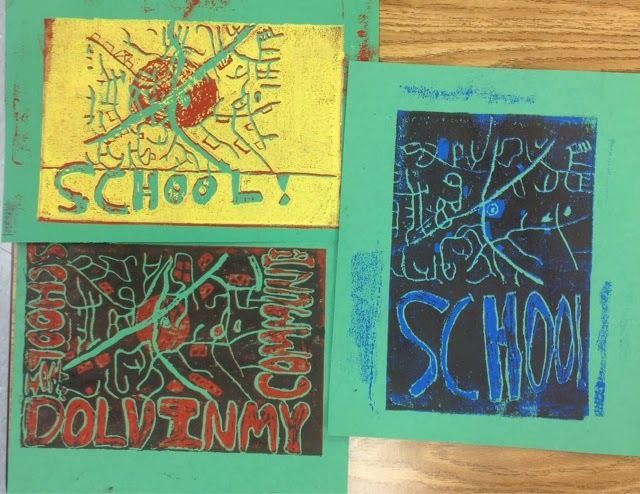 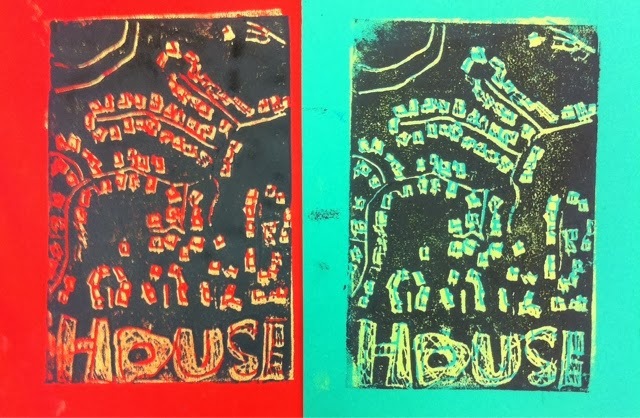 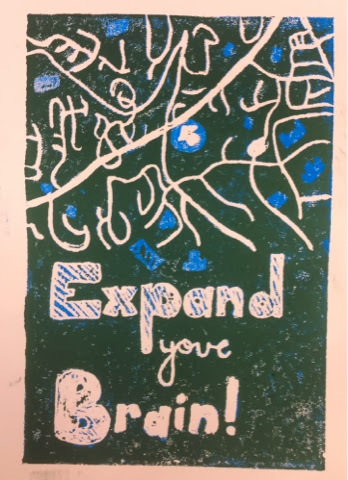 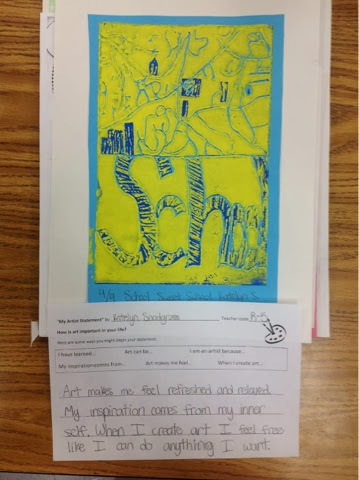 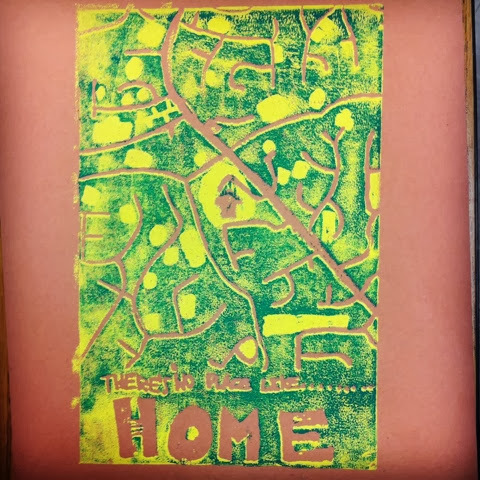 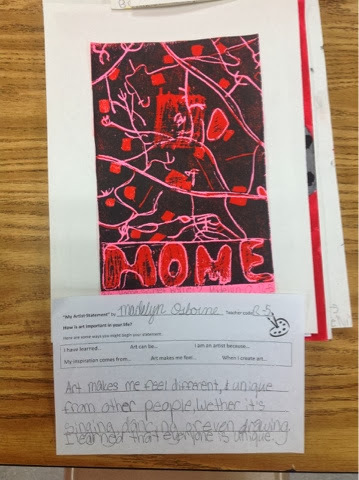 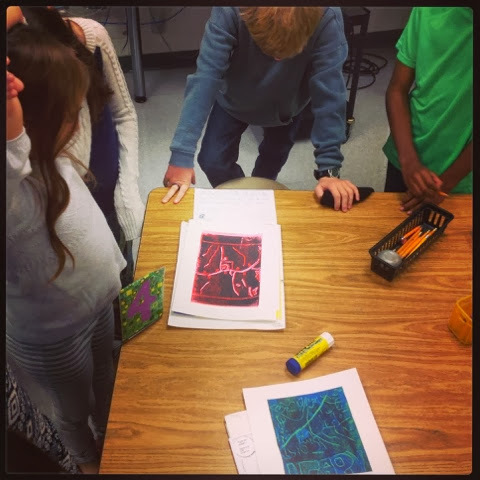 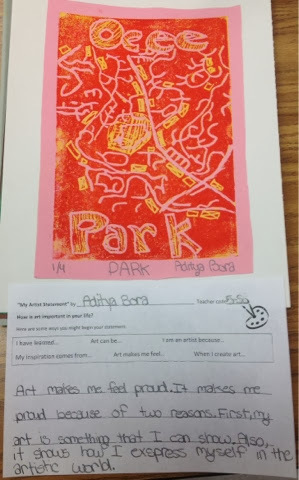 I have done this project with my third graders over the last few years as a collagraph printing lesson with great success. 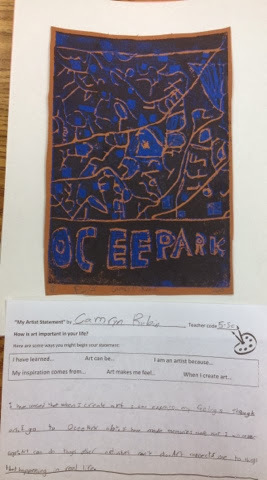 My timing was a little off this time around, so we did it as a collage and we will approach collagraph with a different subject when we return in January. 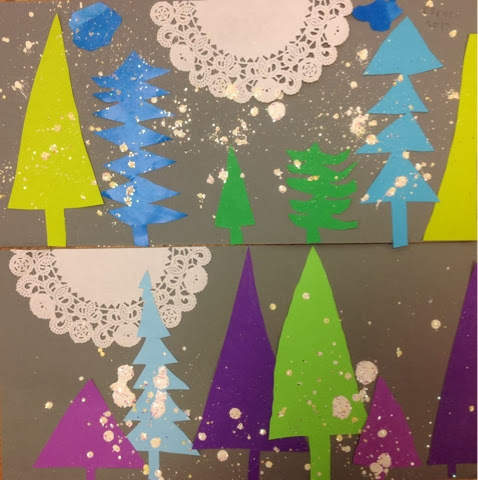 Using Fadeless brand paper, we selected warm or cool colors for our trees, inspired by the tree lot scene from Charlie Brown. 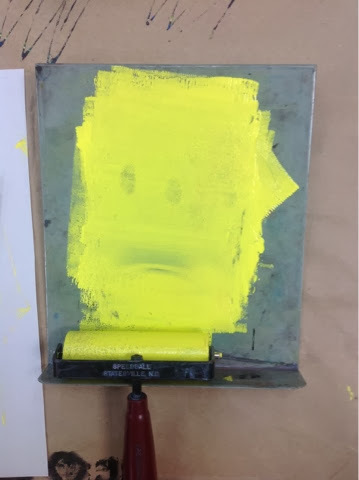 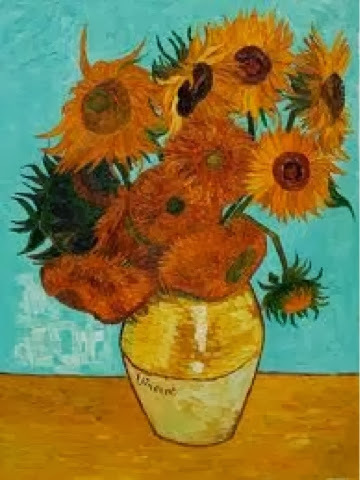 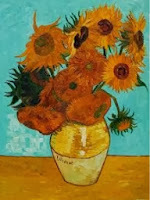 That's a perk of being artists - we can choose any colors we want for our ever"greens". 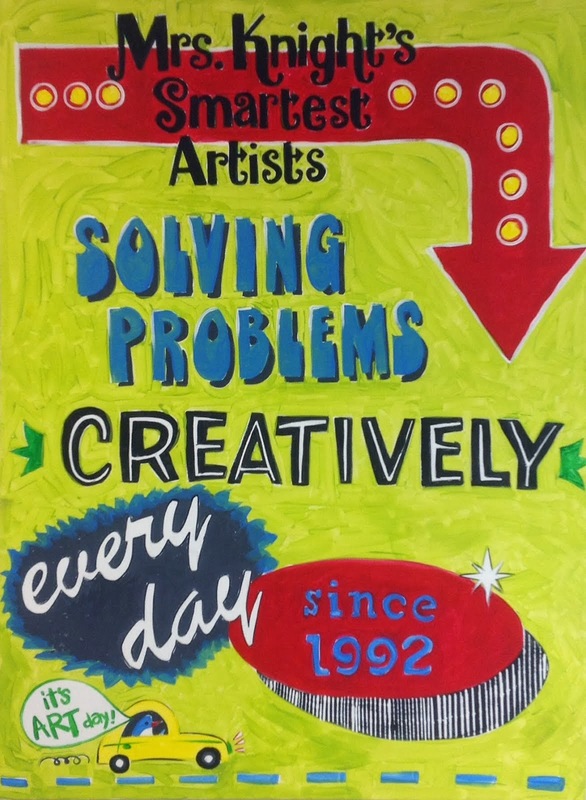 I like the Designer pack of Fadeless paper because it includes metallics and a wide range of intermediates. 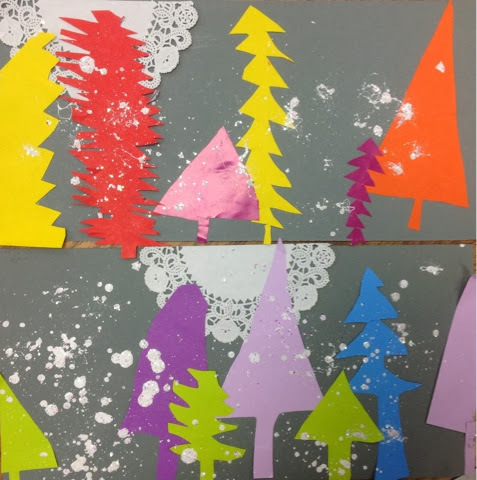 We looked at photos of real evergreens like pines, spruce, and fir when drawing the tree shapes. 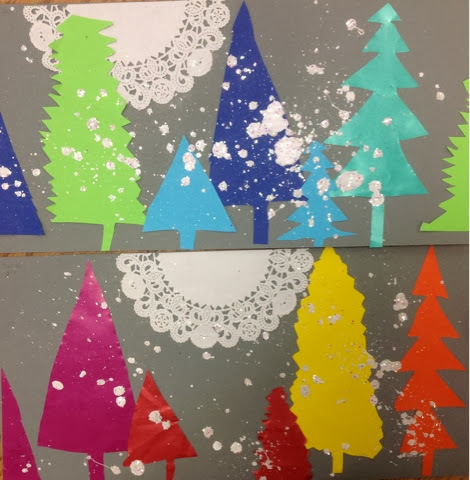 Overlapping was emphasized in the placement stage, and a final spritz of white paint followed by a dusting of clear glitter tops it off. The doily at the top makes a great snow cloud. 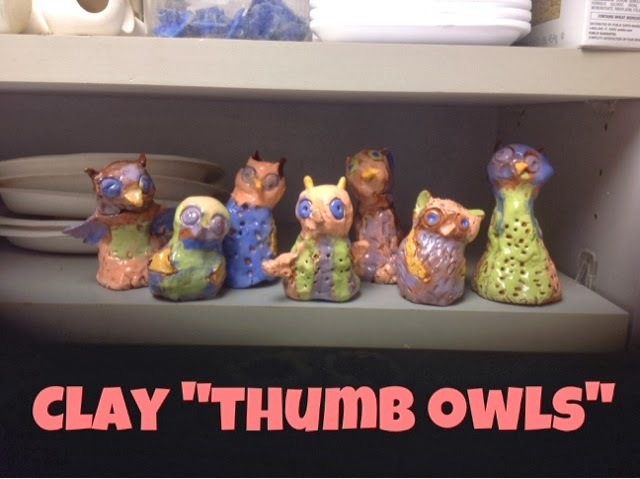 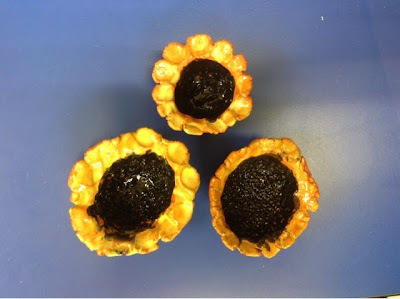 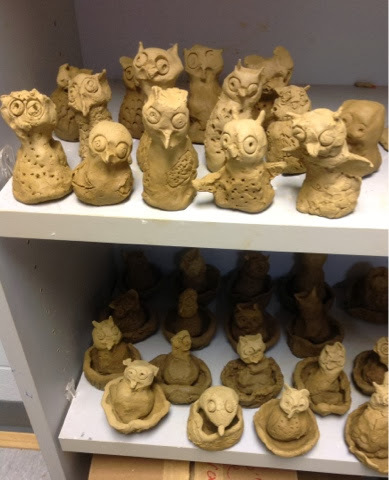 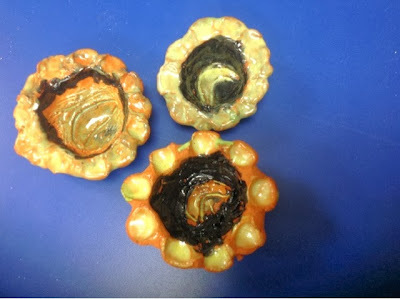 Second graders learned modeling, pinching, and surface design techniques with this fun lesson. 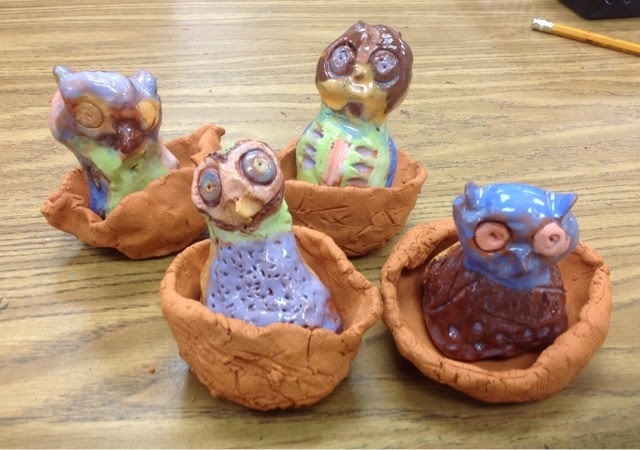 This year we added pinch pot nests too! 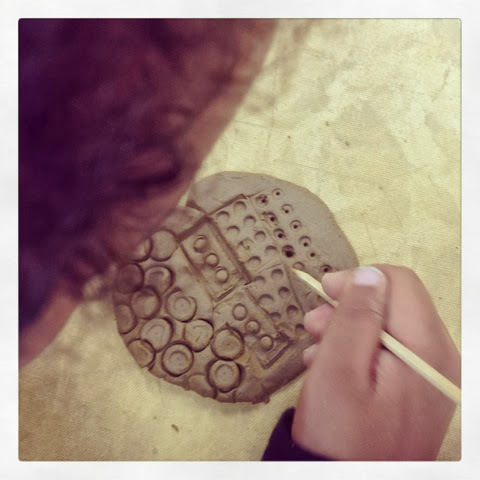 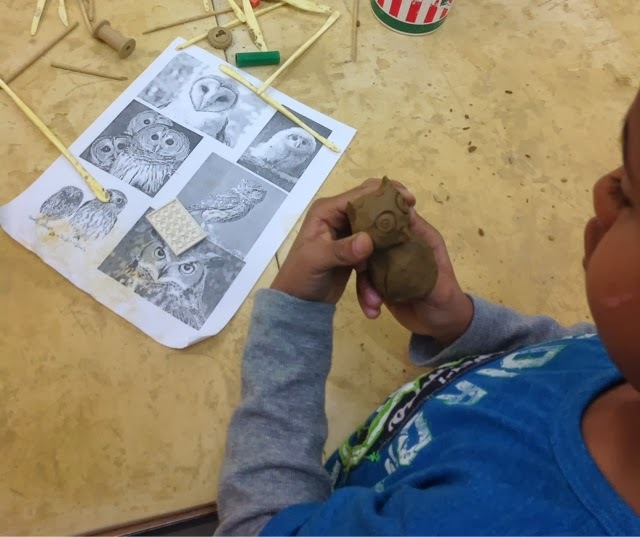 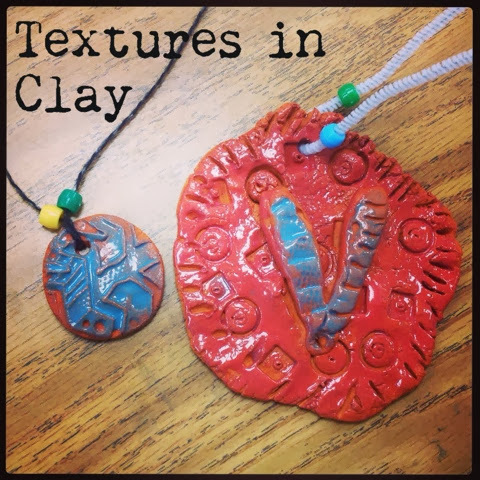 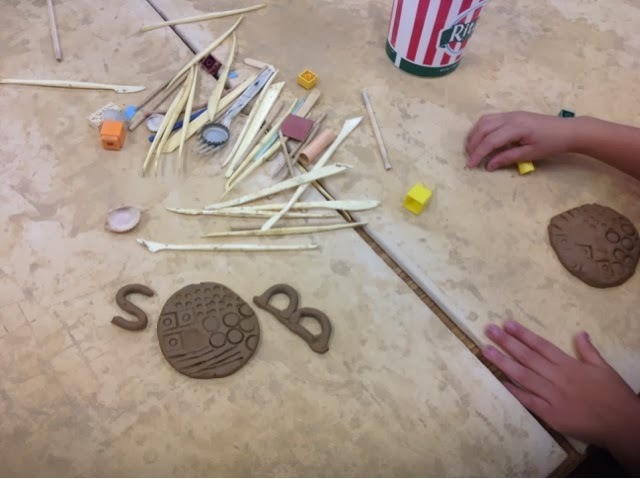 Kindergarteners made two clay projects involving textures and surface design - the first was an ornament with a pressed texture slab and a rolled coil letter monogram. 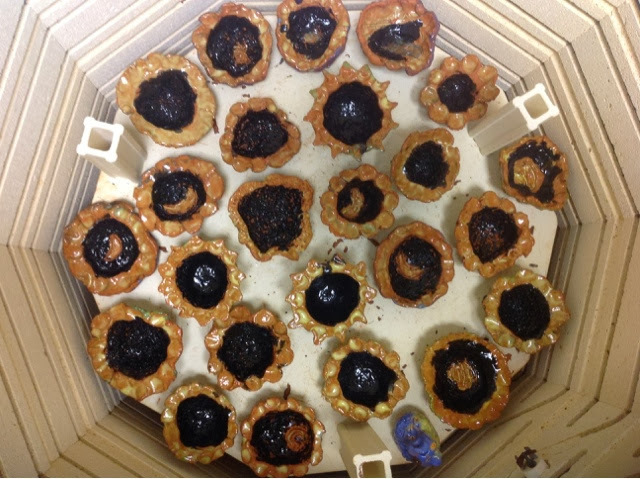 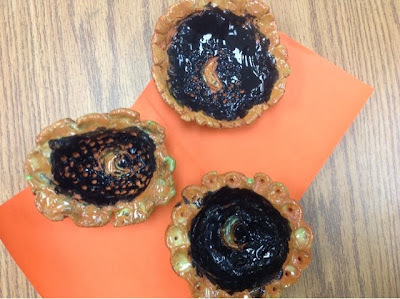 They learned how to join the coils and how to apply glaze. While that was going on, I had each one step on a small ball of clay, creating shoe print charms for necklaces. 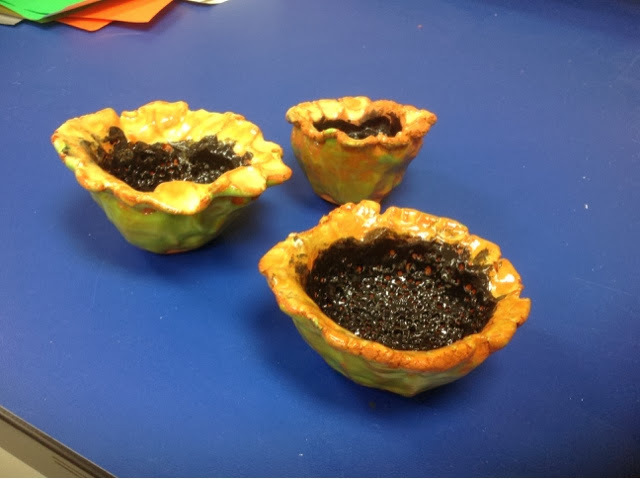 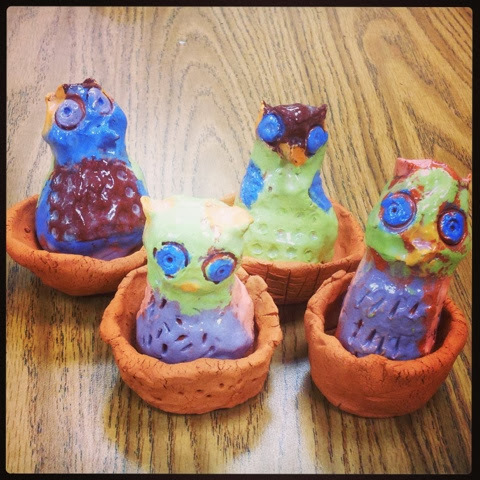 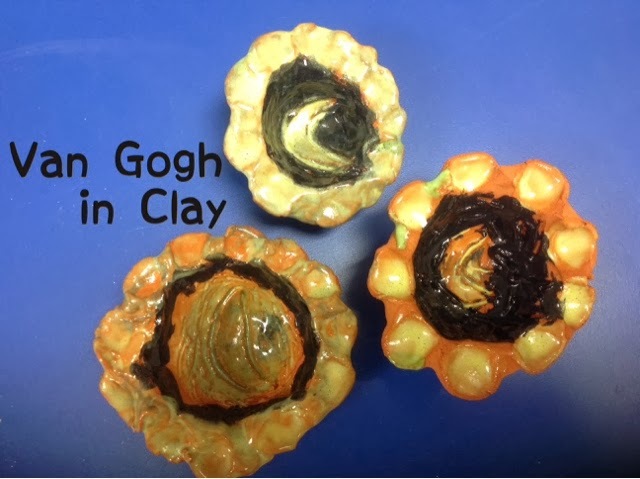 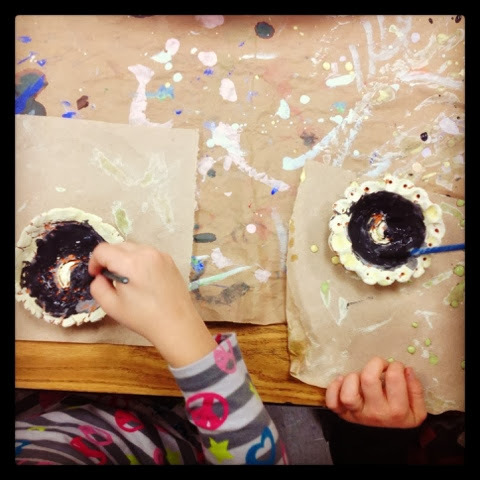 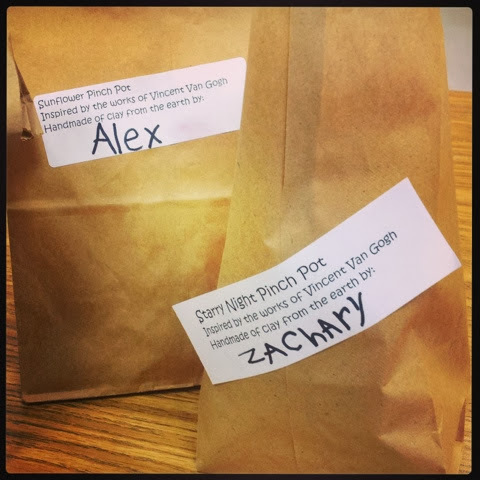 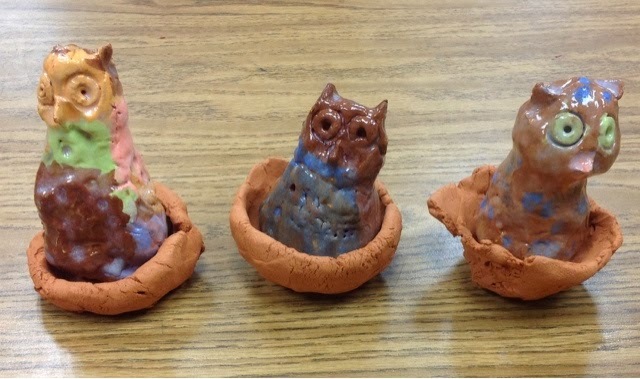 Vincent Van Gogh is a featured artists for my first graders every year, and we even interpret his works in clay - here are our pinch pots, formed and glazed to represent the crescent moon from "Starry Night" or the famous sunflowers from his still lifes. 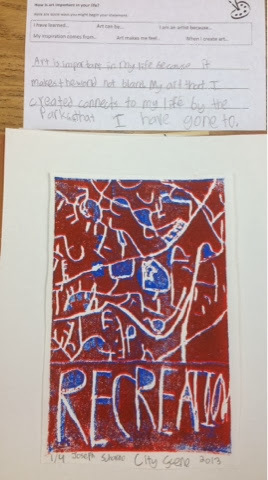 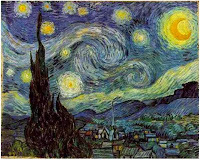 He is one of my all-time favorites, and it is a joy to celebrate his work with these little artists. 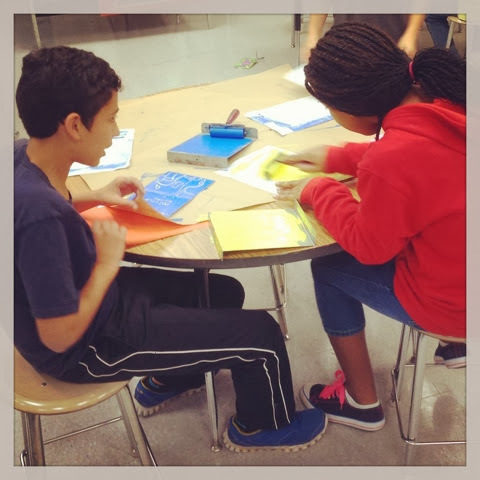 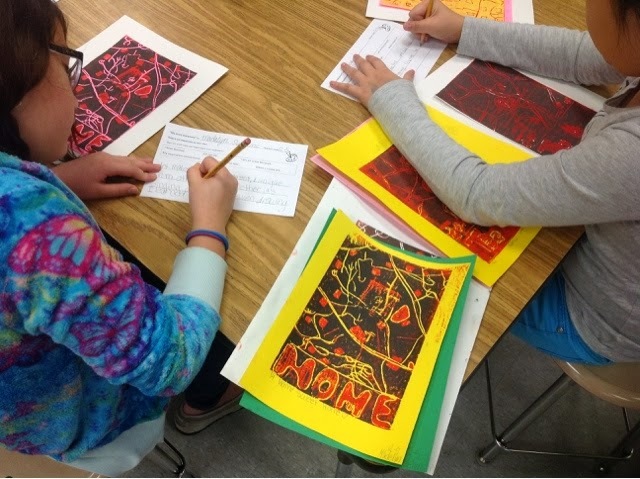 5th graders are in the final stages of our reductive printmaking project. 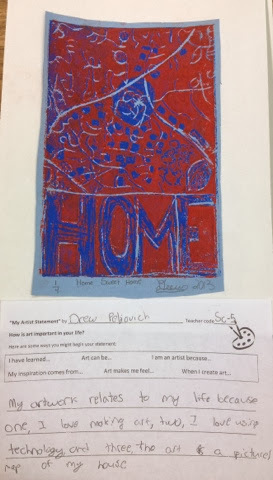 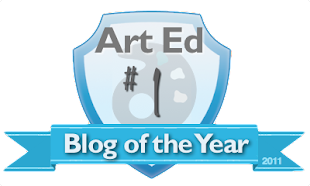 In years past, we have done self-portraits and winter imagery as our subject matter, and this year one of our goals is to make more connections with our art and use personal voice, so we decided to use our community as our source of inspiration. 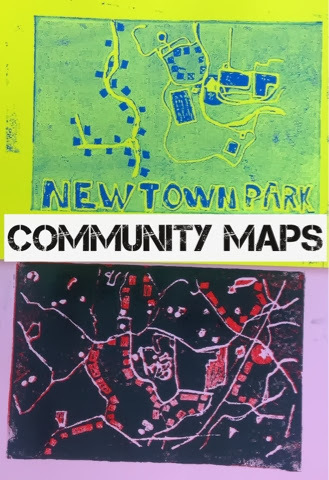 We used Google Maps to find places in our community that were meaningful to us - our homes, local parks, favorite restaurants, places of worship, etc. 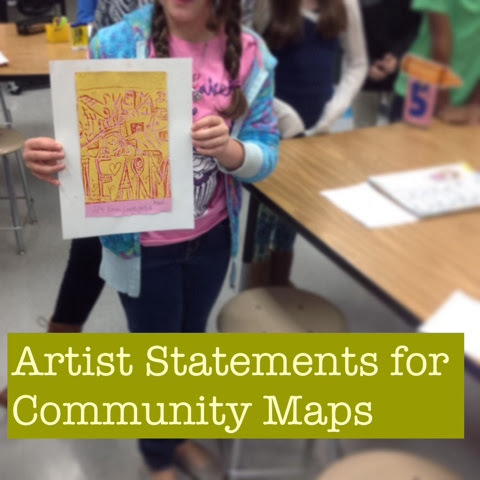 and we transferred the lines and shapes from the maps on to our styrofoam printing plates. 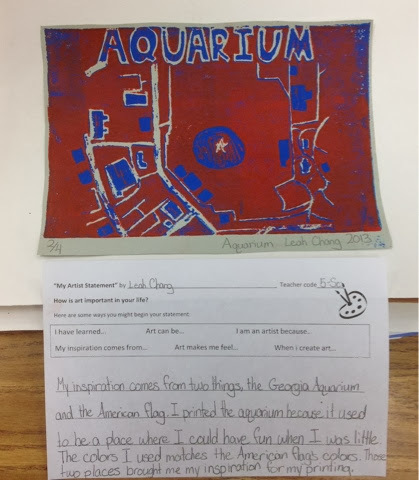 If the size of the printed Google map wasn't big enough to fill the printing plate, we added a descriptive word or phrase, backwards of course! 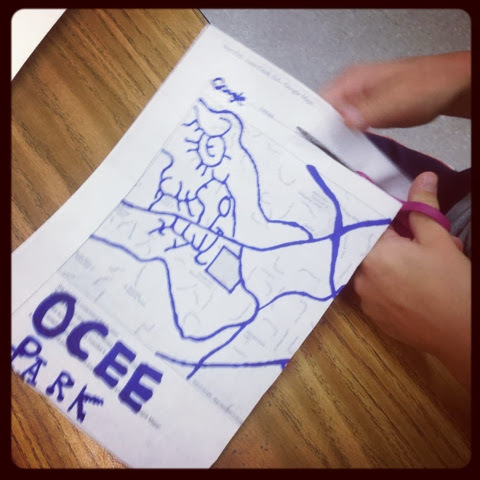 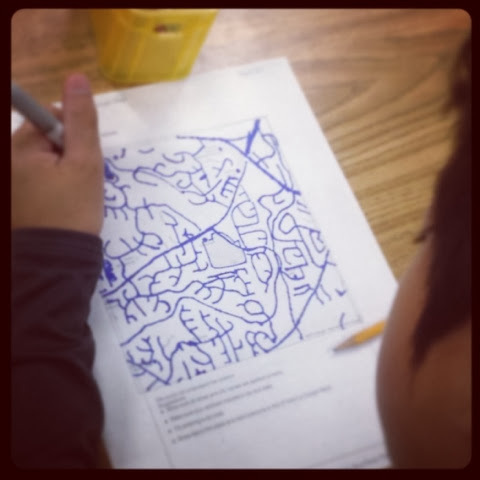 Here, students are tracing their maps with Sharpie, so the lines can be seen on the back of the paper for the backwards transfer. 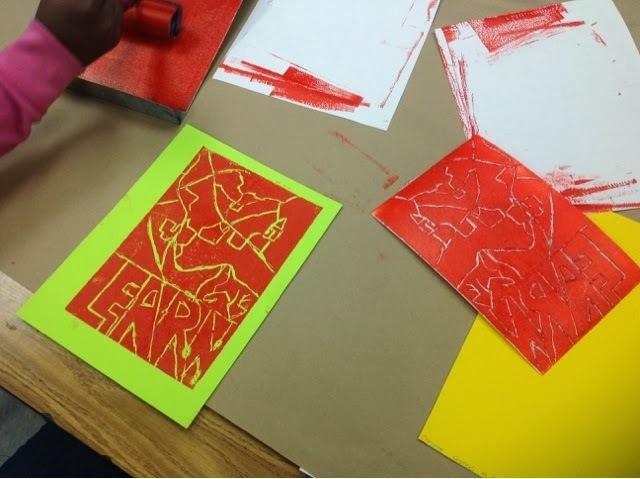 Now we are ready for our first layer of printings - students selected 4 sheets of construction paper and pre-labeled them. 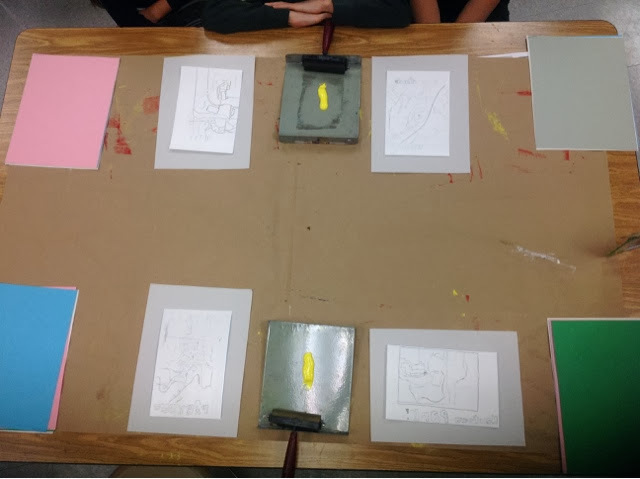 Setting up the printing station is a big deal - we try to focus on "messy middles" and "clean corners", which keeps inky stuff in the center to share and our clean printing papers on the table corners. 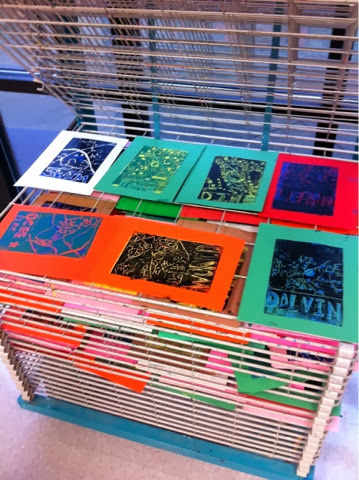 The next step is to clean the printing plate and reduce the printing area. 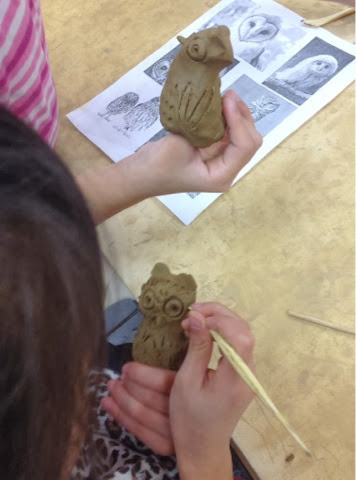 We used our dull pencils to fill in shapes and add more details that would enhance the second round of prints. 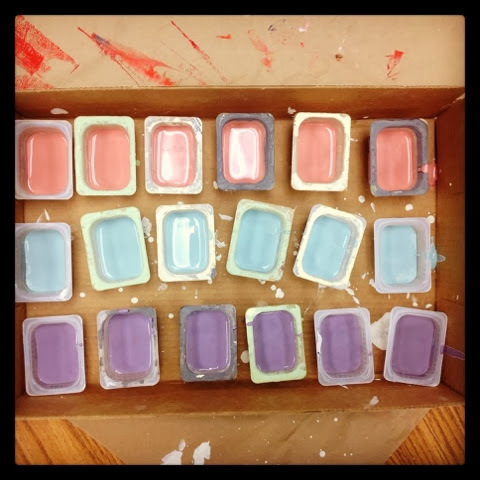 We do this at the end of the first printing session. 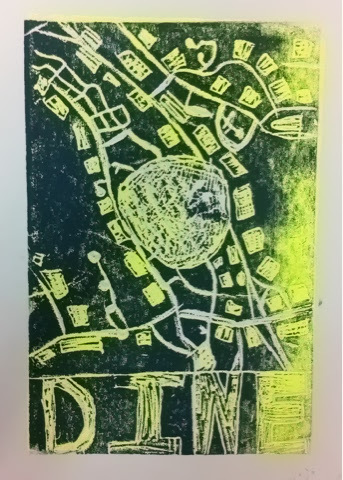 That way we are ready for printing round 2 at the start of the next session. 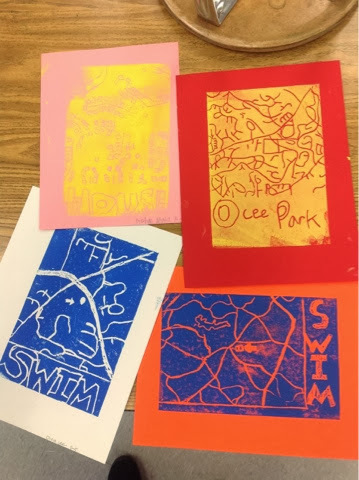 Here are some final prints before trimming, labeling, and presentation mounting - I think they are so great! 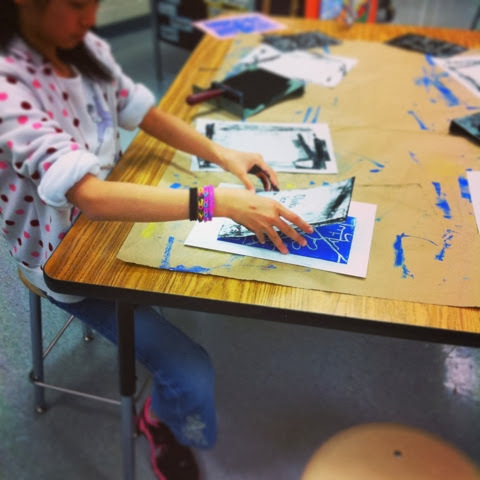 Printmaking is one of my favorite mediums and everybody had fun with the process. 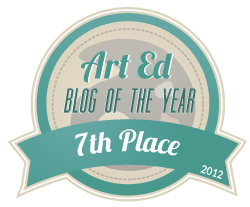 I look forward to seeing the fial presentations all trimmed up and titled next week! 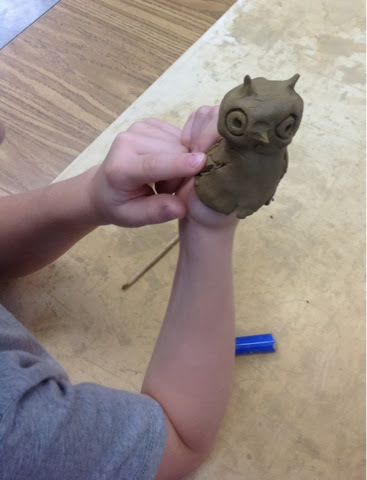 Guess Who Came to Visit Us!